Pro Street Fighter returns in a new format that promises a lot of hype. 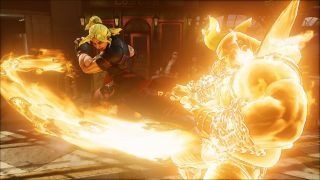 It is almost time for the Capcom Pro Tour for 2017 to kick off, bringing with it nine months of Street Fighter V action that spans the whole globe and culminates with the Capcom Cup—and a chance for one player to win a whole load of prize money. Last year’s was the biggest to date, but not without its problems. Put simply, qualification for the Capcom Cup was incredibly convoluted. There was a global leaderboard and several regional leaderboards and then regional qualifiers and automatic qualifiers and they all overlapped and I’ve given myself a headache just thinking about it. This year, Capcom have streamlined the entire process, making things much easier for both players and fans. There’s now four very clear ways a player can qualify for Capcom Cup and the chance to qualify has been much more fairly spread across the four Pro Tour regions. First of all, last year’s winner NuckleDu is already qualified for the Capcom Cup 2017, ready to defend his crown against 31 other Street Fighter pros. Already showing that he hasn’t missed a beat since Season 2 dropped, Du has been putting on some really convincing performances against top tier players in the off-season. Check out his sets against Ricki Ortiz and FChamp from the Lupe Fiasco/CPT Kick-Off Event a few weeks back. The interesting wrinkle to this is that NuckleDu is still incentivised to compete in the full Pro Tour, as his leaderboard placement will dictate his overall seed at Capcom Cup. As well as all that potential prize money! Next, one player will qualify at a last chance qualification event taking place the day before the Capcom Cup. This will no doubt attract players from around the World and potentially create a bit of drama heading into the main event itself. Imagine the hype if someone who sneaked in at the last possible moment went far in the tournament? This is a smart move by Capcom, and it looks like it’ll make for some compelling viewing. Twenty six players will qualify from a more streamlined global leaderboard. There will be no automatic qualifications from winning a premier event, which was a major source of last year's confusion. Instead, the points system has been restructured to make it clear which events a player would have to win to get into the qualification slots. Ranking events now dish out points for the top 16, with the winner getting 160. Premier Events now award points to anyone who makes the top 64, with the winner now getting 400 points, which is going to go a long way towards helping someone stay in the qualification spots. Finally, Anyone in the final 256 players at Evo gets some CPT points, with the winner getting a massive 1000 points which will certainly guarantee a qualification spot. The excellent CPT account AceKingOffSuit on Twitter said that an early estimate based on last year’s season indicates that 600 points would get you into the Capcom Cup. The final four players will come from regional qualifying events. Yes, there are still regional leaderboards, but all they are now is to determine the seven players that enter this event, with the final one getting in via a Last Chance qualifier, ala Capcom Cup. The winner from the NA, EU, LATAM and Asia regional qualifier enters the Capcom Cup. Interestingly, these are actually region locked this year. It was a bit of a mess last time around. For instance, noted Street Fighter legend and definite Japanese man Daigo Umehara won the European last chance qualifier. This season, only eight players from their respective regions will be competing in this regional last chance events, providing a greater spread across the entire Capcom Cup. Events-wise, the Pro Tour expands further in 2017. Again, split into four regions, the competition will be taking place across the entire globe, landing events in Ho Chi Minh, Dubai, Curitiba and *ahem* Birmingham, as well as many others across the US, Europe, Latin America and Asia. There are now fifteen premier events, with America getting the lion’s share of them. Interestingly, there doesn’t appear to be a premier scheduled for the Latin America region right now. Expect that to change. It’s looking like the Tour will kick off on March 10th with Final Round 2017, a premier to get things rolling. Finally, the prize money pot. Twitch have dived in wielding a handful of lovely Amazon money and upped the prize pot for Capcom Cup to a frankly ridiculous $600,000. Whoever wins that will make a record amount of money for competitive fighting games. Twitch sponsoring the event will likely draw more eyes to the product, which alongside things like the recently announced televised E-League tournament (which itself has a prize of $250,000) should attract more big name sponsors. Big esports teams are already jumping on board the FGC train and I don’t think we’ve seen the last of them. Competitive Street Fighter is one of the most exciting esports to watch and it has been fascinating to see it grow over the last twelve months—where it has grown exponentially more than previous years—and it shows no signs of slowing down. It still has a way to go to hit the ludicrous heights of Dota and LoL, but this year looks like it'll be a massive step towards that.